- Publisher Not just activities, these bulletins get kids excited about the Bible and God's plan for their lives. And becuase the children are quietly learning, the church's adult parishioners can give their full attention to the worship service. Each book includes bulletins for ages 3-6 and ages 7-12. 128 pages each, reproducible. 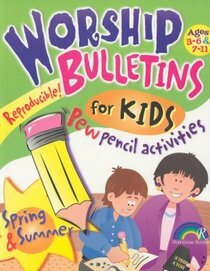 About "Worship Bulletins For Kids: Spring & Summer"
Not just activities, these bulletins get kids excited about the Bible and God's plan for their lives. And becuase the children are quietly learning, the church's adult parishioners can give their full attention to the worship service. Each book includes bulletins for ages 3-6 and ages 7-12. 128 pages each, reproducible. Pearson has 58 yrs. of experience teaching children in Sunday schools, children's crusades, Vacation Bible schools, and other settings. She is a puppeteer and ventriloquist and author of 18 books and over 600 articles. She has been involved in full-time evangelism activities, working along with her husband, Pastor M.N. Pearson.